Serena and Jeff did EVERYTHING right for their wedding day. Everything. And I am absolutely over the moon about the fact that I get to share these details with you today because OHMYGODTHEYARESOGOOD. Serena and Jeff are the kind of people I'd like to be friends with (do you think social media pleas to them will do the trick?!). Let me outline the reasons that they're the coolest couple and, thus, why I want to hang out with them all the time. Serena has killllllller style. Like, just the best. Her gown was insane, her veil was perfection, and her bridesmaids' dresses are ACTUALLY something those ladies wanted to wear (and looked incredible in). They spent the afternoon of their wedding day at Bitter & Twisted. This is my favorite bar. This should be everyone's favorite bar. 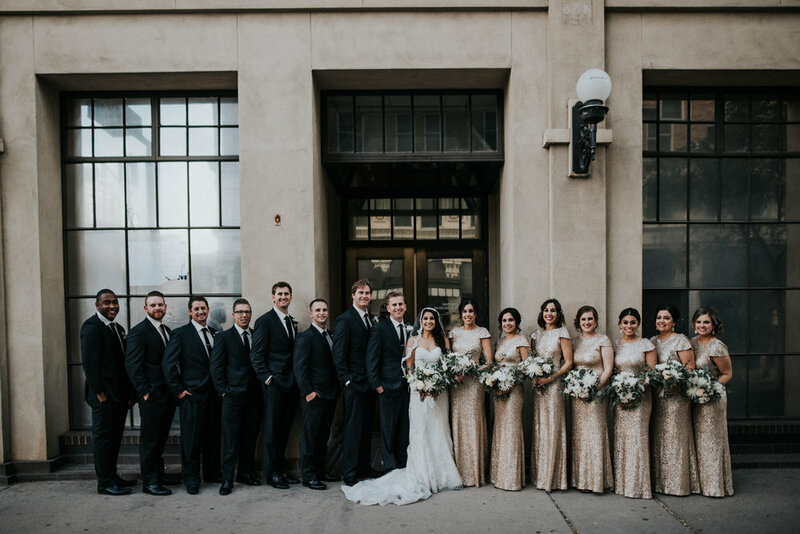 They somehow blended a chic, downtown vibe with more traditional wedding day elements (their stunning church ceremony) and managed to make every part of the day feel incredibly genuine and joyful. Also, as I am always on a crusade for giving "grocery store flowers" a spot in the limelight, I love the fact that Serena loved mums. Because guess who else loves mums? YEAH IF YOU GUESSED ME YOU WERE CORRECT. So, I lived my best mum-filled life when I created their designs and almost two years later I'm still weepy-happy over how stunningly gorgeous everything turned out. Serena's mom spent the year prior to the wedding sourcing the candle holders for the centerpieces from goodwill. She found MATCHING VINTAGE CANDLE HOLDERS for the ENTIRE WEDDING. This is not an easy feat. We accented them with the sweetest little clusters of eucalyptus and mums and roses. It's such a simple design and the end result was incredibly beautiful. So, what do you think? Can we nominate Serena and Jeff for coolest wedding ever? Ok great I'm so glad we're all on the same page. I'll see you next week with more H&H client magic.